I am currently teaching Greenland kayaking skills in Gothenburg, Sweden, care of Johan and Sara Wagner of Escape Kajakcenter. Classes will run until November 2 — if you are in the area, please stop by to say hello! 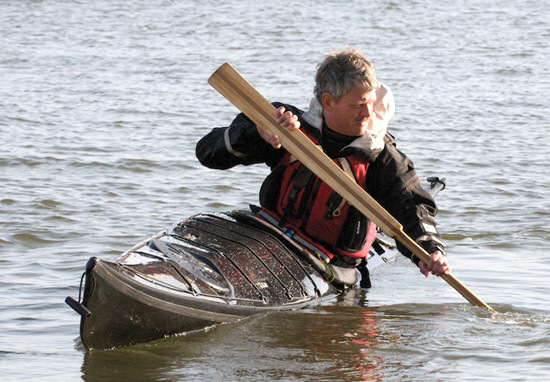 To date I have given lectures of my Newfoundland and Iceland circumnavigations and have been working with students to help perfect their forward stroke, bracing, directional strokes and other skills with a Greenland paddle. The weather has been cool and breezy. Today Johan and I crossed to Nidingen Island (a bird sanctuary off the coast with Denmark barely visible in the distance). During the 25K paddle we experienced F5-6 headwinds, sun, rain, hail and our own private lunch table high atop the lighthouse. The return trip was fast and fun with strong following seas. In addition to kayaking I will be visiting some of the local museums and look forward to viewing both historical kayaks as well as old Norse and Viking boats. Tackar så mycket Sara and Johan for your fine hospitality! Please view my photo gallery from Sweden. 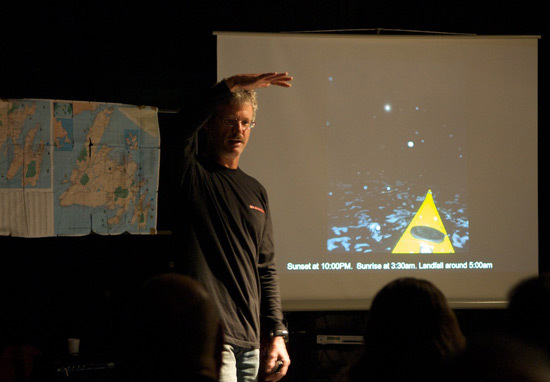 My life has been a flurry of actively since the completion of my solo Newfoundland expedition, including teaching at the Qajaq TC Michigan Training Camp, Maine Island Kayak Company’s New England Intermediate Rough Water Symposium and even returning to Newfoundland to visit again. This week I teach at the Delmarva Retreat (America’s largest Greenland-style event) and following I will be teaching in Sweden at the Escape Kajakcenter from October 23 – November 2. 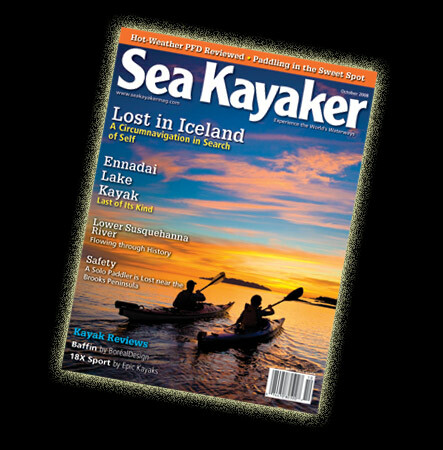 The October 2008 Issue of Sea Kayaker Magazine contains my article, “Lost in Iceland” — about my record-setting circumnavigation of Iceland in 2007 with German kayaker Freya Hoffmeister. I find most trip articles (travelogues) difficult to read, so this article was meant to be something very different. It is a very personal account of my struggle to bust out of my safe but confining “cubicle” in the corporate world, to seek a life that I am more passionate about. I found it a very difficult article to write.